Drawing this strip was a true labor of love for me. I probably could’ve gotten away with doing the strip in 4-5 panels, but I really wanted to show all those old video games to build up the emotion in jefbot. Plus, the panels were just fun to draw. Researching the artwork for those cabinets really took me back to a time when there was nothing more exciting than spending an afternoon in an arcade. I still get excited when I hear a few bars from the soundtrack of games like Moon Patrol and Donkey Kong, and I can still identify almost any game from the eighties from hearing just one or two sound effects. Nowadays, arcades exist virtually, accessible through your computer or home game console, but even though there’s a sense of community and a lot of fun to be had with friends online, it’s just not the same. No strip for me either. What the heck you did?! NO ONE CAN SEE THE STRIP!!!!!!!!! Don’t tell us you loaded the psd file again… I’m NOT gonna install SAFARI in my machine. You better fix this or else I’ll find a way to kick you (no hugs attached this time). Gah!! no Jefbot for the day, my friday is ruined!!! He’s asleep guys, he was up all night working on it. I’m sure he’ll get around to it when he wakes up sometime this afternoon. hey guys, yeah, was sleeping but mombot called to tell me that no one could see the strip. not sure what happened this time – it was a jpeg (not a psd, like before), and i could see it on my mac, but… *guh*. might have to buy a PC netbook so i can check these things out. anyway, i just republished and reuploaded it and it now seems to be okay. weird. my apologies! going back to bed. So your mom woke you up to tell you your webcomic was down. Go Mom! And we don’t even know her name! Figures, as soon as Kevin chimes in to try to steal viewers for our own strip, Jeff gets a whiff and it’s working again! heheh. eagle-eyed mombot to the rescue, Stan! Awesome page. I used to love the arcade. Hey check out my comic let me know what you think. I’m just startin’ out. thanks, cyberdog. checked out your strip – looks cool, man! Welcome to Nostalgia.com where you can relive your past… except now you can be one of the cool kids since you’ve lived through it as a nerd already. glad we can share a tear, Das Twig. man, i’d love to play that game in an arcade again. your dad, Tim!!? ugh, now my warm feelings of nostalgia have turned into the chill of old age. 😉 if you feel like having the game all to yourself again or want to give your dad a gift, Tron 2.0: Killer App for the Game Boy Advance has Discs of Tron packed into it! and about your interest in seeing how i put the strips together – i’ve been thinking about doing a Ustream broadcast, but probably not until i can do these strips within a couple of hours. maybe editing some footage together would be more logical? UGH. Another webcomic that panders to the wet dreams of gamers. At least this is actually about GOOD games (ie: the old ones, not this Halo/God of War crap). BTW I can’t tell if the girl is a beaten-up Keebler elf or that’s just your art style. I understand the “blood” is red paint, but seriously, puberty has not been kind to her face. yep, a Donkey Kong machine would definitely be part of my Nirvana, JK! OMG!!! So worth the wait!! That was amazing. I love the color the content… and the LOVE Story~ Outstanding job! Your Mpm’s the best and the strip is terrific!! ha! thanks, reynard! embrace your perv-dom!!! Wow! So many panels! This one is superb, bot. 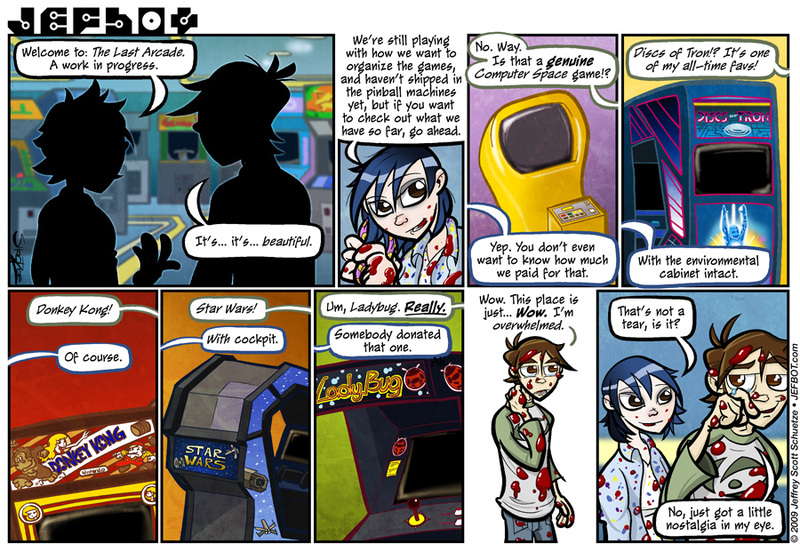 I love that you drew your favorite arcade games from when you were a kid. I can’t believe you remember what they look like. I mean a lot of time has passed since the 60’s. 😉 Kudos on a fantastic double decker, brot! well, in addition to having the images burned into my brain, I also have access to Google images, Michael. 😉 glad you dug the double decker!!! all good games, CheddarMan! i’d add Ms. Pac-Man, Star Castle, Dragon’s Lair and Galaga to that list. hot damn. that girl looks cute ……..woof woof..
You seem to be a local. There’s a sweet arcade on near Vermont and Santa Monica Blvd. It’s on Vermont across the street from Los Angeles Community College. There’s also a small but nice arcade in Little Tokyo but my directions there would be even more vague..
totally gonna check that arcade near LACC out, raeraethejetplane. thanks for the tip! I got to admit that I have NO idea of any of these games (well, except for the Kong one). And I do love video games. Nowadays I just play the evil “shoot-the-zombie” ones at my local arcade. Is a good stress reliever when you pretend the zombies represent your evil boss. i’m sure mombot will appreciate the happy mother’s day wishes in super advance mode, Sonitan!!! and yeah, i love those zombie-shooting games, too. have you tried “Left 4 Dead” on the XBOX 360 or PC? it’s a zombie game and it’s awesome. definitely worth checking out if you have a machine to run it. oh, and let me know what you think of the “smoky eyes factor” in the next strip! That nostalgia in the eye thing… contagious? I agree that the are of the arcade excitement has passed, but Xbox Live isn’t a completely soulless substitute. it could be contagious, eleventeen – just don’t touch your eyes after handling a video game and you should be okay. and you’re right about XBOX Live. i’m down for more crashing of castles whenever you are!!! Wow. This is a videogame masterpiece. if i’m ever up there, i’ll definitely check out that arcade, emikae! Awesome strip! I had a Chuck E. Cheese flashback (when they had real games!) of pretending to be Luke Skywalker in my own X-wing! Pole Position was cool too! For oldies but goodies, don’t forget the arcade at the Redondo Pier – The Redondo Fun Factory! Cheers! chuck e. cheese’s was like, the coolest place *ever* when i was a kid, d.lio! and yeah, loved star wars and pole position, too. Awesome! Have you ever been to funspot? the one in NH that was featured in King of Kong : Fistful of Quarters, bob234? if so: nope. but someday! I’ve been to Funspot 4 or 5 times. It’s freaking amazing! All I’ve got to say is much agreed about arcades, nothing seems nearly the same… Not even those kids party places that have a bunch of games to play, no one cares about high scores there, only how many tickets they get. Although I’d have to say I’m kinda one of them when trying to make sure my kids have a good time.